Got this card for my on-going work on the notorious Snook-Hix murder case back in 1929. 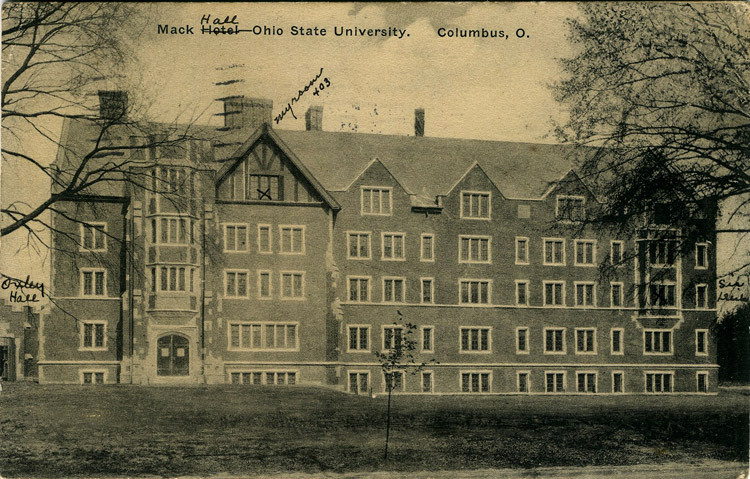 Theora lived in Mack Hall as an undergraduate from 1924-28. The girl who wrote this postcard probably knew her. What really sold me though was the message on the back. Has nothing to do with the murder. It’s a snowy Thursday night, January 29, 1925. Mary is writing her friend or sister Beatrice back home in tiny Beaver, Ohio in Pike County. She talks about the heavy snow, her cold, and student teaching at Northwood Elementary. A mutual friend has gotten a radio. She’s looking forward to a fudge party Saturday and a blind date with a friend’s frat brother next Friday. She asks Beatrice to send her silk dress for the date. I love these little captured moments of life here nearly 90 years ago.